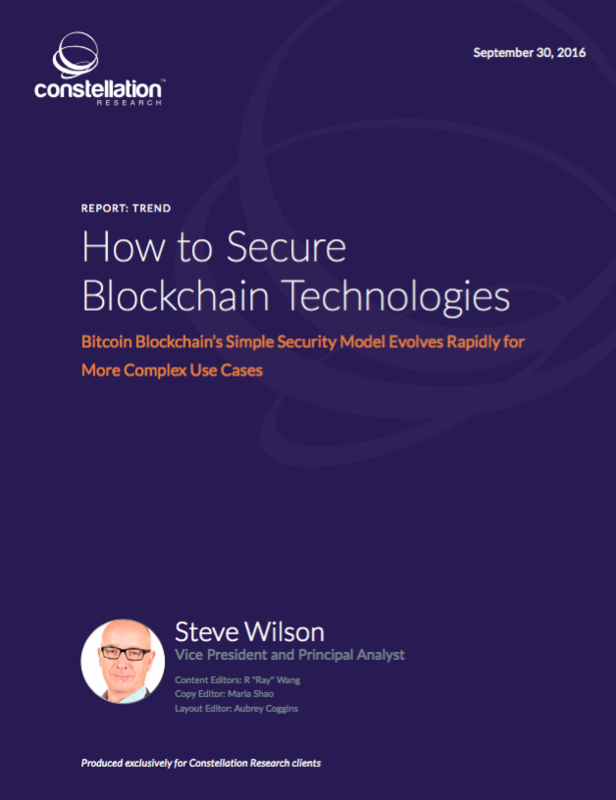 How to Secure Blockchain Technologies | Constellation Research Inc. This report identifies the rapidly evolving security measures (including permissions, encryption, hardware security processors, and application security) needed for common closed business applications of blockchain. It also examines what these measures mean for the core distributed ledger algorithms in both public and private blockchain systems. Securing the newer blockchain technologies requires that organizations understand how the security characteristics of spinoff ledger technologies differ from the original Bitcoin network. This report traces the evolution of blockchain from a conceptually simple distributed ledger meant to prevent “Double Spend” of e-cash into various incarnations aimed at complex activities, from identity management to intellectual property security. A previous Constellation report, Beyond the Hype: Understanding the Weak Links in the Blockchain, described how this technology is inspiring fundamentally new developments.